The Acne Cycle. Acne vulgaris, also known simply as acne, is one of the most common skin conditions in the United States. If you suffer from acne you know it’s more than just a few pimples on your face. 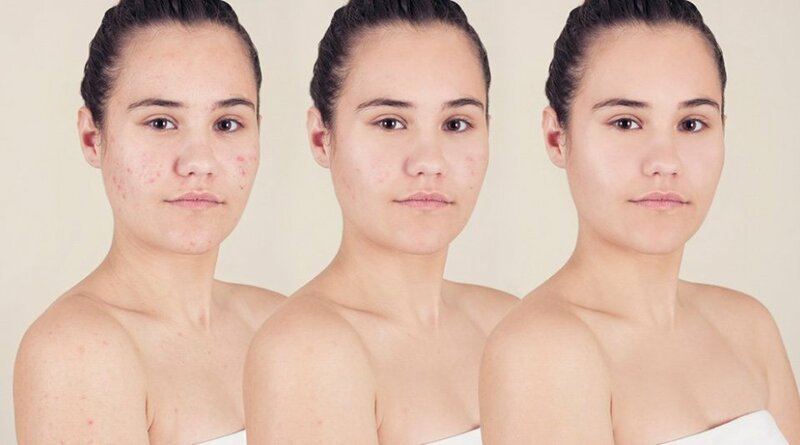 Acne can affect every area of your life and make you feel alone, unattractive, even depressed. But now for some good news there are treatments that can help you get acne under control and let you enjoy life with clear skin and the confidence it brings. When you see a red bump, whitehead or blackhead on your skin, it’s usually gone through four stages to get there. Step #1 is a clogged hair follicle or pore. Your skin cells are constantly renewing and when old cells die off they shed. The result: fresh, new skin about every month or so. However, if you’re acne-prone, these dead cells mix with the oil (aka sebum) on your skin, become sticky and clump together inside the pore. When that happens oil and the bacteria that causes acne (the p. acnes bacteria) gets trapped inside. Step #2 in the formation of acne is the overproduction of oil. The question is why are you producing so much it? Basically, androgen hormones stimulate the release of sebum from the sebaceous glands attached to your pores. Things like puberty or emotional stress can increase androgen levels, causing you to produce more oil which leads to more clogged pores. Think of it like there’s a stopper, or plug, trapping gunk inside your pore. As you continue to produce oil it continues to be trapped behind the plug, which builds pressure and causes irritation. At this point, the p. acnes bacteria, which naturally grow on your skin, now have an abundant supply of food (oil and dead skin cells) to feast on. As a result, they start to breed inside the plugged pore. Step #3 on the path to breakouts. If the bacteria and sebum stays trapped below the skin surface, a whitehead is formed. If the pore opens up, the sebum, which contains the skin pigment melanin, oxidizes and turns blackish and a blackhead is formed. Step #4 occurs because the bacteria continue to feed on your oil. As they do so, they release byproducts your body recognizes as foreign invaders, causing it to produce an immune response. White blood cells rush to the infected area and this causes swelling, redness and inflammation. The end result is a breakout of the throbbing, red, tender bumps you know as pimples (aka papules and pustules).